When renovating your home, it’s important to know what type of flooring works best for each area of the house. For instance, hardwood may be perfect for the den on the main floor, but did you know that you shouldn’t use solid hardwood in your basement? To help make your home renovation a little bit easier, we’ve put together a guide to choosing the perfect flooring for every room. We tend to spend the most of our time in the living room or family room. Whether we’re watching TV, entertaining friends, or chasing the kids around to get them ready for bed, these floors get constant use. Do you want a hard floor or soft floor? If you prefer something soft and luxurious to sink into after a long day of work, new, luxurious SmartStrand Silk Reserve from Mohawk is both astonishingly soft and incredibly durable. How much foot traffic will the floor need to endure? With its Forever Clean and All Pet Protection technologies, SmartStrand Silk Reserve is the softest, easiest to clean and most durable carpet around, which makes it perfect for a heavily used family room. If you live alone or don’t see much foot traffic in your home, frieze or textured carpets may be perfect for your bedroom. A frieze carpet uses longer cut yarns to add a little extra bounce or sponginess underfoot. Textured carpets are incredibly popular because of their dense, cut pile that surrounds your foot in softness with every step. If you have a family, carpets made with plush SmartStrand Silk Reserve fibers provide a great option for any type of traffic. And if you have a few kiddos or active animals running in and out of your room, the low profile and tight construction of looped carpet can provide durability as well as beauty and comfort. The kitchen can be one of the most fun rooms to remodel. Do you envision a gorgeous tile floor? Or do you prefer to spice things up with a hardwood look? Do you long for a rustic farmhouse kitchen or a sleek, modern space? 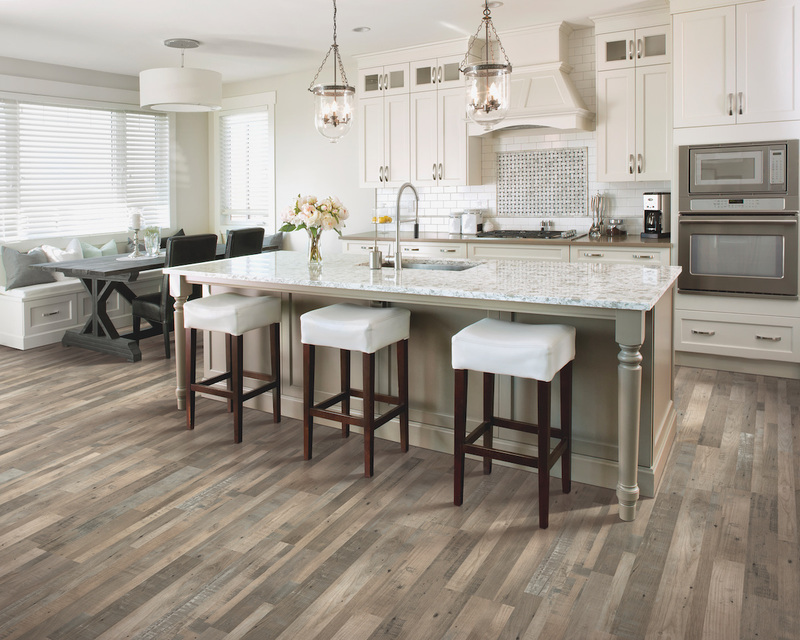 Tile floors have long been the standard for kitchens, but advances in flooring have opened up new options. 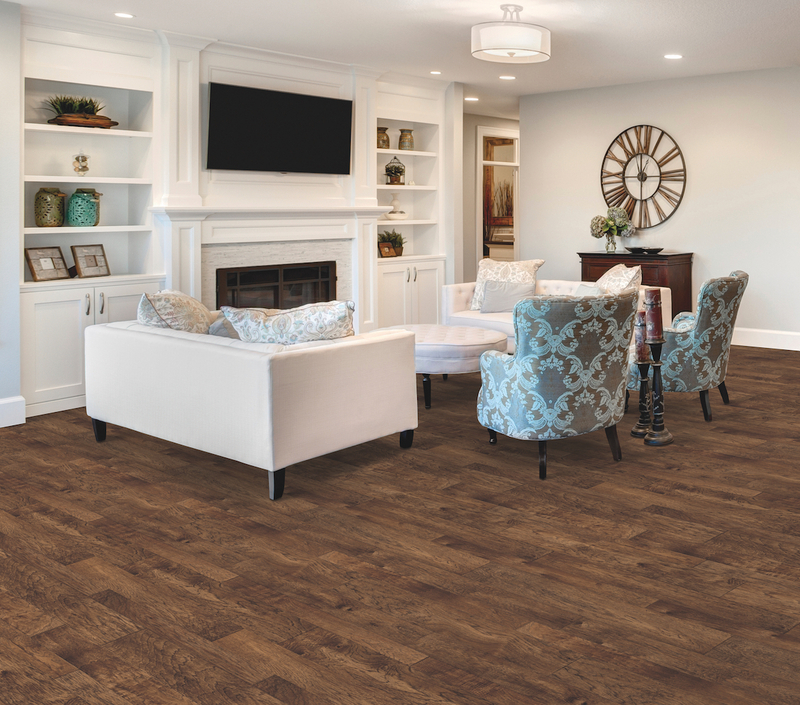 Innovations in Luxury Vinyl Tile, like Mohawk’s SolidTech LVT, give you the classic hardwood look but with superior scratch resistance and waterproof capabilities. You no longer have to worry about dropping a utensil or spilling a dish and ruining your floors! 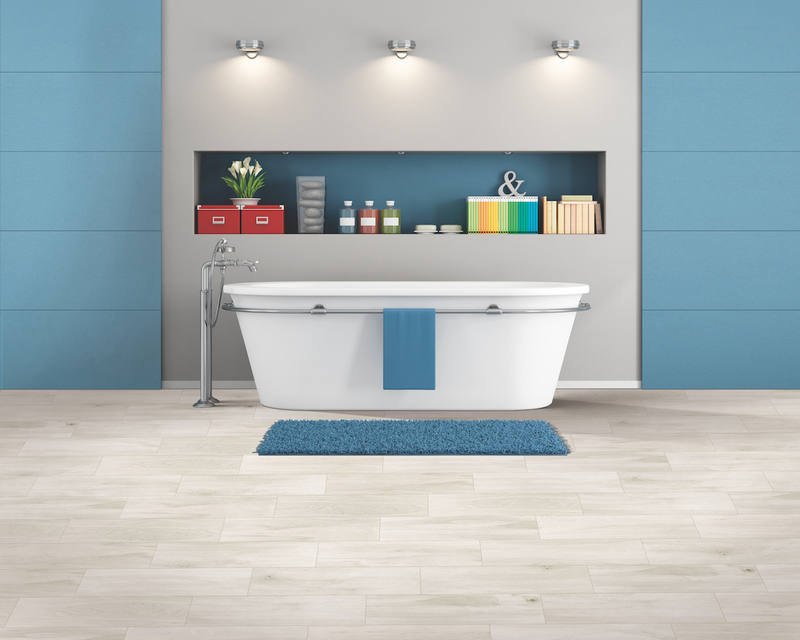 Choosing the perfect flooring for the bathroom is a little trickier. Tile can give your bathroom an elegant stone façade or a wood look that’s ultra-resistant to moisture, stains and wear. If you need something a little bit warmer under foot during the colder months, LVT provides a waterproof option that is incredibly easy to clean and maintain. A custom bound area rug can be used to beautify and soften a floor in any area of the home. Placed on top of either hard or soft flooring, they can add color and pattern to the room while protecting your floor at the same time! If you’re having a hard time deciding between a hard or soft floor, a custom bound area rug over wood or tile can give you the best of both worlds. Contact us about binding your favorite carpet. What kind of flooring are you considering for your home?